When I moved to Britain I wanted to make sure my blog also felt like it had moved and changed to reflect my life here. So many things are different about life here compared to back in Sydney. Surprisingly the availability of food, equipment and services are much harder to come outside of London. As I’ve mentioned in previous posts, the availability of European and Asian (I don’t mean Indian) ingredients is harder to come by outside of the melting pot of London. I’m noticing small changes like the opening of the Thai shop and buffet on the High St, and supermarkets are making a big effort to stock global brands. The abundance of Polish food in the supermarkets tells me there must be a good-sized population of Poles in Maidenhead, and while it’s similar to other European ingredients and products it’s not quite the same. I was looking to make a very specific Italian dish called Focaccia di Recco last week and I had all but given up hope that I’d find the soft and creamy Stracchino cow’s milk cheese I needed for the recipe when I found it. In Maidenhead. I’m going to dedicate food-hero status this week to the Italian Continental Stores. Located down the road from their original, smaller location, this super-deli is now housed at the massive Jubilee House on Denmark St in Maidenhead, (SL6 7BN). They are probably the biggest Italian deli in this country with over 6000 products on their shelves. The Italian Continental Stores is by far the biggest delicatessen I have ever seen and it’s just my luck that they’re here in Maidenhead. They had Stracchino cheese and I made my Foccacia di Recco. A Genoese friend also told me that I should be making it with Manitoba flour, and so next time I visit I shall see if they stock this also. For the uninitiated and those who haven’t watched Jenny Morris Cooks the Riviera (which is where I learned about it) – Focaccia di Recco is not your typically thick and bouncy slab of bread. It is in fact a speciality of the region of Liguria in Genoa, and made famous by a restaurant called Manuelinas. It’s a thin and crispy treat filled with Stracchino cheese and is made with unleavened dough. 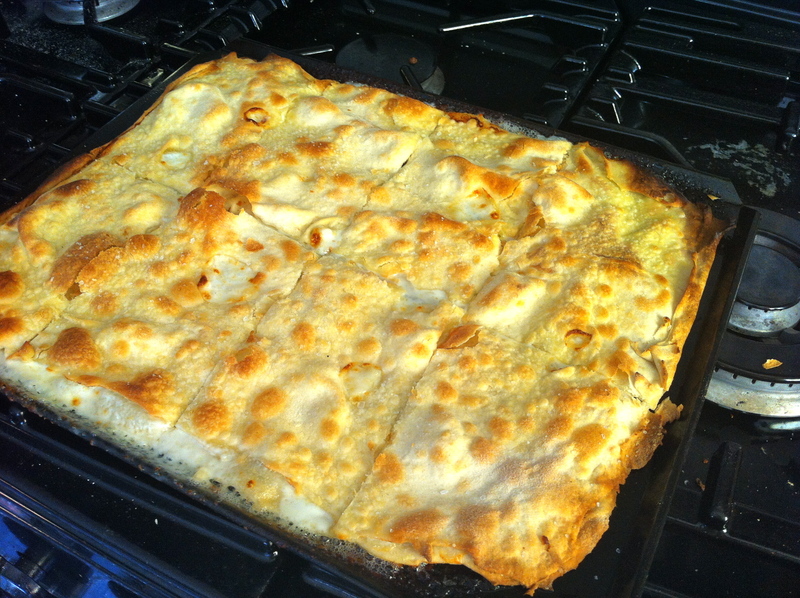 You can find an excellent tutorial on how to make Foccacia di Recco here at Manus Menu. Worth a trip to Genoa I’d say, although I can get to Maidenhead a lot easier!